This special issue of Carbon, a collection of reviewed papers, was presented at Symposium A, Fullerenes and Carbon Based Materials at the combined 1997 International Conference on Applied Materials/European Materials Research Society Spring meeting (ICAM'97/E-MRS'97) held in Strasbourg (France) from 16-20 June 1997. 140 presentations were given at the conference in seven different sessions. The most extensively addressed research fields were carbon materials in general, diamond-like carbon, pristine, polymeric and endohedral fullerenes, nanotubes, and carbonitrides. 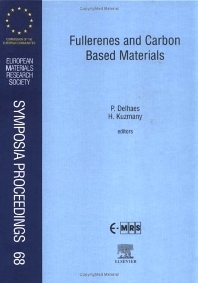 Of accepted manuscripts, the largest number of contributions is dedicated to carbon materials in general and to fullerenes. Highlights in the former are the discussions on hydrogen-free carbons and on hard carbon coatings. In the fullerenes group many new results on polymeric structures and on endohedrally-doped higher fullerenes are reported. The field of carbon nanotubes is strongly represented with reports on new techniques for the production of the tubes and where the analyses by scanning probe microscopy and light scattering are the central problems. Carbonitrides as well as a few contributions from related molecular materials like cubanes or oligophenylenes are included. The symposium proved to be a valuable venue where new scientific and technological problems in the field of new materials were reported. For materials scientists with an interest in the field of carbon research. Universität Wien, Institut für Materialphysik, Strudlhofgasse 4, A-1090 Wien, Austria.